You love reading books? You are a bit nerdy but love fashion? Perhaps it’s time to match a bag to your personality and perhaps its time to let the world know. Carry the Dolce & Gabbana Dolce Book Bag is a good start. 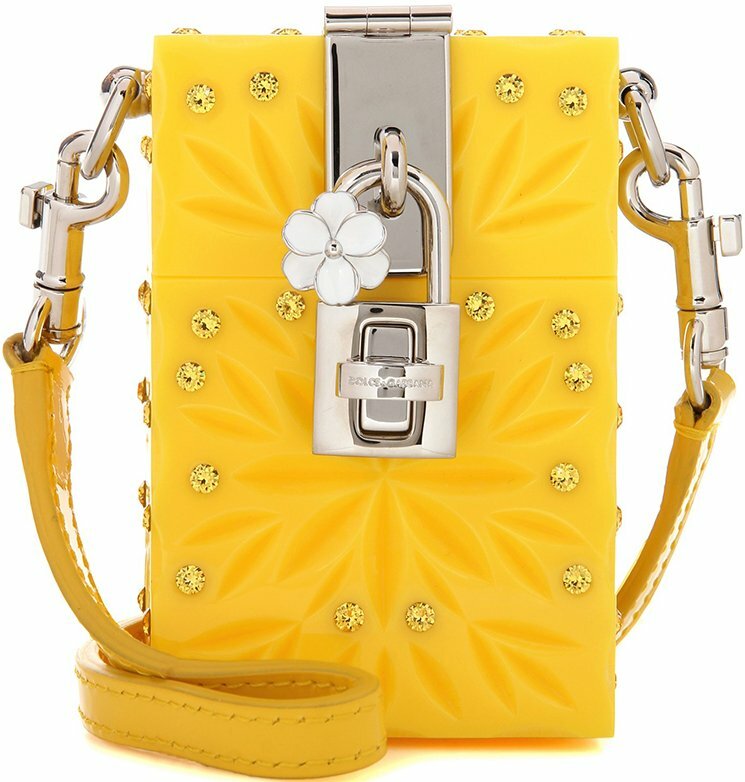 Like in all Dolce Bags, the center is adorned with the classic Dolce & Gabbana lock as well as a mini lady-like flower. It’s just beautiful. The bag is made with a top handle as well as a leather strap for shoulder carry. But the strap can be removed anytime. Now here is what this bag is all about, the ridged book details in bold hues are going to help you start conversation everywhere. People will be amazed by this bag, and it’s from D&G! Take a look at the bright-colored books, what do you read? Sicilia IV (representing a famous region in Italy), Dolce & Gabbana, Opere Liriche (operas), Flori (Flower), Teatro (theather), Arte (Art). The interior is made with one large compartment and a slot pocket. Measuring 6’ x 7.5’ x 3’ inches, priced at $8145 USD, €8025 euro, $12500 AUD, $60000 HKD, ¥720000 JPY. The invitation to Dolce & Gabbana’s spring 2017 runway show read "Tropico Italiano," but the event itself on Sunday afternoon was not quite the fun-loving-Italian-on-vacation-in-tropical-printed-swimsuits-and-bustier-dresses that we expected. Rather, it clarified the brand's position on what purpose it thinks its runway shows should serve. Leading up to the show, the brand began teasing images on Instagram of its cadre of millennials who would be sitting front row: Sofia Richie, Brandon Dallas, Luka Sabbat, Brandon Dallas, Dylan Jagger Lee, Sarah Snyder and more (read about all 21 of them here) — the brand even shed a spotlight on them before the show began so that those of us sitting across from them (including many a U.S. editor with a strong social media following) could snap a few photos in the otherwise dark space (or perhaps so they could snap selfies?). Dolce & Gabbana had thought of everything — even guest hydration. As we walked into the venue, attractive men were manning a coconut stand serving fresh coconuts with straws. As the lights dimmed again and the music changed from the entirety of Justin Bieber's "Purpose" to upbeat Italian Tarantella music, we expected the standard procession of models in colorful outfits. But instead, a group of Neapolitan dancers in street clothes ran out from the audience onto the runway and started breakdancing. The phones came out, the Snapchats and Instagram stories were shared and eventually, the dancers were replaced by models — Hailey Baldwin included. (Surprisingly, there were no Hadids). Despite the fruit, the collection itself just didn't seem all that tropical (and the breakdancers didn't quite fit into that theme either, as far as we could tell): The show notes offered something of an explanation: The Tropico Italiano isn't a real thing that exists, but rather "an imaginary line that marks the territory which stretches from Naples to Sicily," meaning locals might get some of the symbols Dolce & Gabbana used to reference that region, but to us, the marching band jackets, folkloric crowns, LED shoes and pizza, pasta, cocktail and ice cream motifs felt a little random — though they did make for a cheerful visual feast as they came down the runway, and what more do you want from a Dolce & Gabbana show? As designers the world over rethink when, where and how they present their collections, Dolce & Gabbana said they wanted to adopt "a more personal approach to the design process which is not influenced by seasonal rules or codes," per the show notes. "There are no longer rules in fashion, but what matters is to remain true to yourself." That ethos seemed to be reflected in the haphazard styling seen with many looks: heavily embroidered marching band jackets paired with feminine skirts, an ankle-length jacket covered in sequins paired with jeans, an athletic jersey and shorts worn with heels; and speaking of footwear, many models wore embroidered "hotel" slippers. It was as if whomever styled this show had the attention span of, well, a millennial. Also fitting this theme were the many rule breakers in the front row: young people who (thanks to privilege, in many of their cases), are carving their own paths in life, whether by creating cool content, modeling, making music or all of the above. As the entire cast of models stormed the runway at the end of the show — Dolce & Gabbana's signature finale format — they wore bedazzled, low-brow "D&G" (remember that line?) T-shirts made to look like counterfeit tees you might find in a tourist-trap street market. It was basically Dolce & Gabbana merch, and paired with some adorable embellished brocade mini skirts, the whole look had major commercial appeal — though we're still on the fence about the flip flops many models had on their feet. But the biggest statement of all was that front row — a statement that recalled the brand's spring 2010 show, where the designers shook the industry by stationing OG fashion bloggers including Bryanboy, Tommy Ton, Garance Doré and Scott Schuman in the front row, many of them equipped with laptops — laptops! Similarly, Sunday's stunt cemented these young, iPhone-wielding Insta-celebs and celebrity offspring as the new influential content creators. Will those independent bloggers suffer as a result? Are editors,' buyers' and journalists' seats going to get progressively worse? We'll have to wait and see. A gorgeous, gorgeous bright bag, no wonder it’s called the Dolce Box Cinderella Mini Bag from the classic Dolce And Gabbana Dolce Collection. 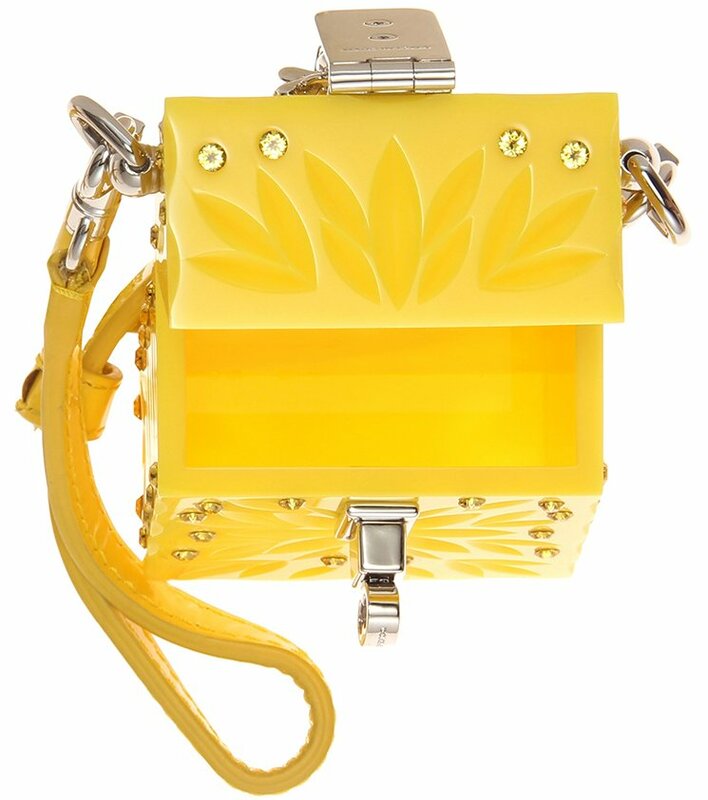 A surefire way to lend that extra ray of sunshine into your ensembles, this happy yellow colored mini bag is the perfect companion to bring. 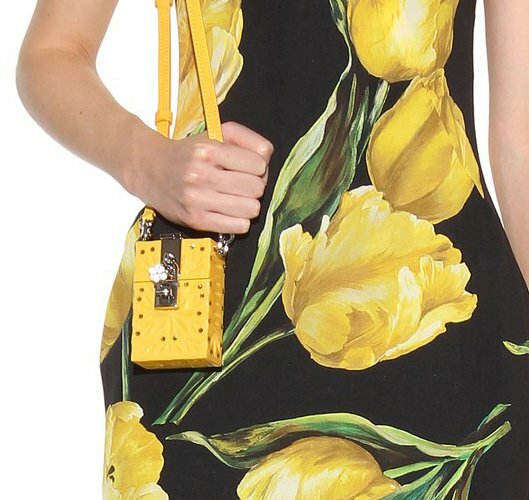 Set in a vibrant yellow structured design with touches of tonal crystals and carved detailing for a dimensional effect, this bag is one for the books. It features the label’s iconic floral-embellished turn-lock that adorns the front for a signature feminine touch. Made from Plexiglas, this beauty also features a detachable, adjustable shoulder strap. Add an instant pop of color to your style by having this mini bag within your reach. Measuring 3.5’ x 2.5’ x 1.5’ inches and is priced $1745 USD, €1150 euro, $12900 HKD, $2700 AUD, ¥189000 viaMyTheresa. Over the past few years’ enormous trend for novelty accessories, bags have been made in the image of a lot of things: books, decks of playing cards, astrological symbols, leather jackets. Rarely do any of these bags also perform any of the functions of their aesthetic inspirations; after all, bags have a pretty specific functional purpose already, and their interior hollowness presents another significant barrier. 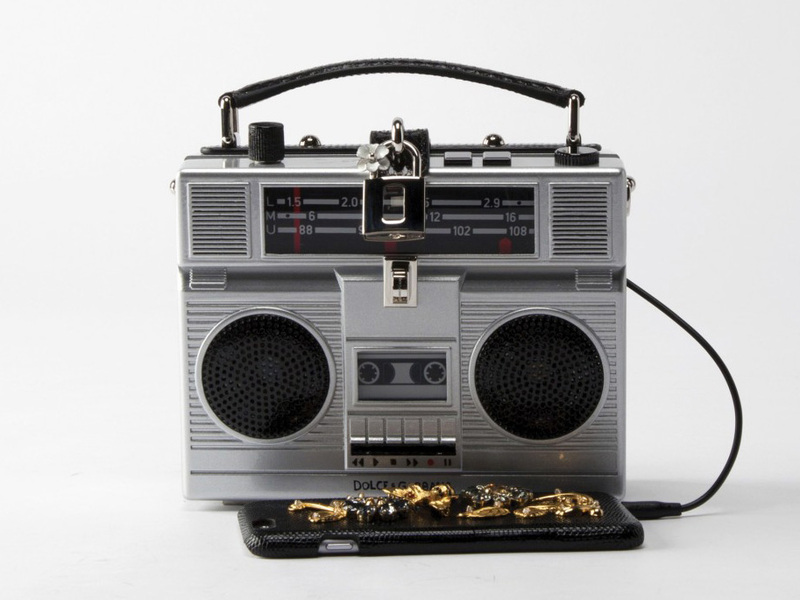 Neither of those issues got in Dolce & Gabbana’s way, though, and soon you can buy a bag that’s also a boombox, should that be a thing that’s useful to you. For whatever this bag will surely cost when it’s eventually available, it really should connect to your phone via Bluetooth (lots of cheap portable speakers do that! ), but instead, you can hook your iPhone up via aux cord and this purse will actually play whatever you choose. On the bright side, that means you don’t have to get your phone and the bag to pair, which I am never very good at. Behold the Rosalia, Dolce & Gabbana‘s latest addition to its summer collection. The white leather mini-trunk silhouette with navy blue stripes takes us straight to a sizzling Sicilian summer. Made with the softest Italian leather, the mini Rosalia is a great city bag (or yacht charter companion) with three compartments and a mirror pouch to organise your cards, spare change and makeup essentials. Nautical fashion never goes out of style, so you can put this one in the ‘investment’ category. We belief that obtaining a ‘natural’ look is the most beautiful way to express yourself in fashion. Too much and it’s exaggerated, too little and it doesn’t create an impact – an overdoses use of make-up does more harm than beauty. And when the flowers start to blossom and the trees turn to green, you need to follow the season naturally. Hide the darker colors deep in the back of your wardrobe and move those that are bright, shiny and colorful to the front. If you are still seeking for the summer tote, take a look at the D&G Escape Canvas Tote. It’s a beach bag, shopping tote and a holiday bag all in one; it’s as roomy as the Louis Vuitton Neverfull and as functional as your can’t-live-without iPhone 5. This tote is made in three different colors, red, black and green. They are all printed with pink flowers and partly made from lambskin to keep it soft and smooth. An internal zip pocket and patch pocket can be found inside, measuring 16 x 28 x 5 cm (H x W x D).